Interests - Emma enjoys dressing up, colouring in, cooking, playing with her toy rabbits and puppies (one day hopes to have a real-life dog when her immune system is strong enough) and playing nurses. 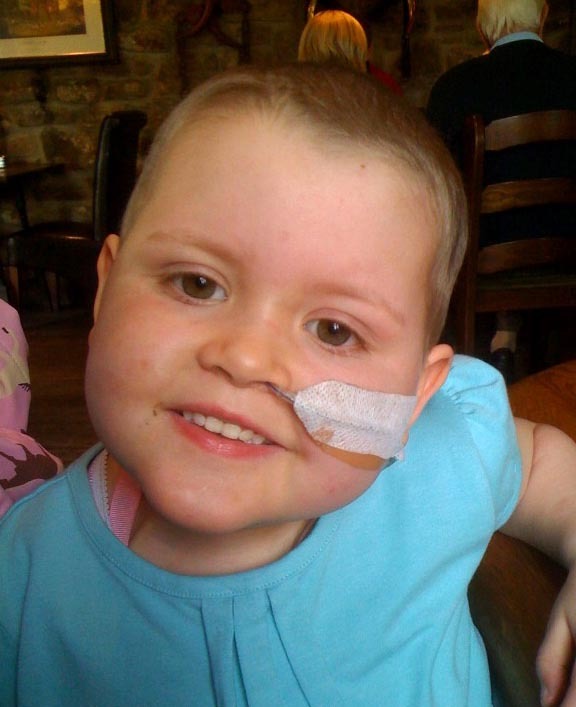 Emma was diagnosed with acute lymphoblastic leukaemia on 25th March 2008. Although it was not an easy process, two rounds of intense chemo and maintenance treatment put Emma into remission. All the signs were positive and Emma was given a good chance of beating the illness. However, in October 2009, came the devastating news that Emma had relapsed and the leukaemia had returned in her central nervous system and her bone marrow. Five months of high dose chemo managed to get Emma in remission for the second time, however a bone marrow transplant including total body irradiation and cranial radiotherapy was Emma’s only hope of remaining in remission. Luckily Emma’s older brother Kieran was found to be a perfect match and he instantly agreed to be Emma’s donor. Emma had her bone marrow transplant on 9th April 2010 and has suffered many complications since then, mainly Graft vs. host disease of the gut and skin. Emma remains in hospital receiving treatment for GVHD at present but hopes to be home soon. We are sad to say that Emma’s Leukaemia returned and she sadly passed away today. It is, unbelievably, a year this week since Emma had her bone marrow transplant. With hospital visits thankfully reducing and admissions almost zero, we now feel it is a good time for Emma to move on from the Post Pals page in order to allow some children who are still in hospital quite a lot to receive more post. I still find it amazing that so many people who have never met us have helped to make Emma smile and have taken the time to write to her and send her and Kieran gifts over the last year. This has been a really positive experience during a truly awful time. THANK YOU to everyone out there who has helped to get us through some really dark days. Emma has had a funny January; she had a stay in hospital with swine flu early in the month and has been recovering ever since. Her energy levels are still quite low but at least it was just flu, not the bad stuff and for that we are grateful. Once again, thank you everyone who have sent us post. I still can’t get over how many kind and lovely people there are out there helping to make my girl smile. Thank you. THANK YOU SO MUCH for all the extremely kind, generous and thoughtful gifts sent to Emma and Kieran for Christmas. They were so overwhelmed by every single one of them and it still amazes me how many lovely people there are out there who are willing to spend a little time to help support children like Emma. You will all be pleased to hear that Emma stayed out of hospital for Christmas this year; the first Christmas at home since 2007. Emma continues to make good progress and has certainly been on quite a journey during 2010; hopefully a healthy, happy 2011 lies ahead. September has been a funny month for Emma – her blood counts have been up and down again without any real explanation. Each time they dip we all panic and think the worst but then they recover and we can all breathe out until it happens again. The doctors seem at a loss for explanations other than sometimes strange things happen after bone marrow transplant. Thank you to everyone yet again for all the postcards, letters and presents Emma has received. You help to lift her spirits and keep her smiling. Thank you again to everyone who has written to Emma this month, especially those who send us pictures of their dogs! Special thanks to the lady from Cyprus who runs the rescue dog centre, she named a dog after Emma which was so lovely – Emma was particularly happy about that. Emma’s had a (dare I say?) good month, she has had a lot more energy and is beginning to want to do things again. We have seen the little sparkle back in her recently which had been missing since her transplant. It is so nice to see her laughing and enjoying herself again. We pray it continues to improve as we know there are no guarantees but for now things are good and we are just taking it day by day. Emma is back at home once again and hopefully this time she might stay here a little longer without giving us any more scares. Emma’s energy levels are incredibly low and she is sleeping a lot of the time but that is hardly surprising considering the amount of treatment she has had over the last 2 years. We have a long way to go but we are definitely making progress, albeit very slow! We hope and pray that things continue to go in the right direction – it is a case of taking it day by day. Post Pals is not only keeping Emma going, but also the rest of us too! It is an absolute joy to read all of the letters, e mails, cards and postcards which people take the time to write. I cannot begin to thank everyone enough – you have all helped us to smile on really horrible days. Very good news from Emma’s doctor – it is not a leukaemia relapse which is causing Emma’s latest problems. She has been very lucky indeed as we did fear the worst. There is another blood disorder called TTP which is stopping Emma’s new bone marrow producing platelet cells and haemoglobin. Her white cells have recovered after some GCSF booster but the doctor says we might never find out the reason why the white cells dipped also. Hopefully the TTP disorder will rectify itself but if not they can treat this with plasmas. All very complicated but manageable. Thank you so much to everyone who has sent us kind messages and presents. They really do keep Emma smiling. Sadly Emma is back in hospital. At first it looked like an infection but gradually things are looking more worrying. We are waiting for the results of several tests and waiting for a suitable time to take a bone marrow sample. Emma is very low at the moment but always has a smile on her face when she gets mail from Post Pals. Emma has been allowed to come home from hospital. Although Emma is really pleased to be out of hospital, it is still very difficult at home as Emma must stay isolated from everyone except for her family and she is also feeling very weak. Hospital visits are every other day for check ups and medication but hopefully with time this will reduce, all being well. We are keeping our fingers and toes crossed now that all this treatment has done its job although only time will tell and for now it feels like a waiting game yet again. THANK YOU to everyone who has written, e-mailed and sent Emma lovely gifts over the last month. It has become the highlight of our day to open Emma’s post and it really does put a huge smile on her face each time she has mail. It is so lovely to know that there are some kind and thoughtful people out there who are willing to spend a little time to write to Emma and they all make a massive difference. Thank you so much! Post Pals is such a wonderful idea and we are so pleased to be involved with it.